Once you find someone you think you might be compatible with, it’s best to start with some parameters. Whether in person or online, set up a trial run with some structure. Suggest a format that will ensure equal opportunity and avoid one-sided critiquing. If you only write one chapter a month, do not agree to critique more than that for another writer. If you’re hooked up with someone uber-prolific, you may be using all of your valuable writing time critiquing their work. Be specific in your expectations. Regular scheduling is important when getting off the ground. Decide on the amount of material and time span. One chapter a month. Ten pages a week. Twenty pages a month. Specify what a page is: double spaced, 1 inch margins. You wouldn’t believe what some folks consider one page of material. Whatever the agreement, respect it. Do not over-commit. Your time is limited. Whether you’re meeting in person, or communicating some other way, keep your time allocation realistic for both supplying work and critiquing another’s. Critiquing can be a great motivator, a deadline of sorts; but you don’t want it to become a millstone that takes you under. Set a limited period for a trial run. Give enough time for multiple critiques, sometimes it takes a while to find a groove. Agree once this stated time is up, the future is a fresh negotiation. Walk or stay. Tweak or go forward as previously. Be courteous. Make certain your work is polished and ready before you share it with your critique partner. No one has time to reread and re-critique the same material over and over again. Even if you don’t plan on resubmitting the same material to your partner, it’s very frustrating to spend time critiquing only to have your partner say that the material was just first draft and they’d planned on fixing that anyway. Really? So what good did I just do you? Be clear on what kinds of things you want your partner to comment on. Plot? Story construction? Pacing? Punctuation? Spelling and typos? Appropriateness for your chosen genre and target readership? You don’t both have to have the same areas for feedback. Once established, follow those guidelines. 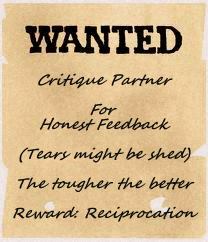 If you discover some glaring problem outside of the requested critique area, ask if your partner would like the feedback before you offer it. Sometimes, especially of the skill levels are a mismatch, one may discover the problems are so many and varied that the page would literally bleed with comments. In that case, I’ve always thought the best approach is to deal with the most basic areas now and leave the rest for later. We all started somewhere and build our skills one step at a time. Overwhelming a person with constructive criticism is often as detrimental as offering nothing but unwarranted praise. Do unto others … it’s relevant in critiquing, too. When making your comments, do it in the same way you want to be critiqued. Some of us are fine with the direct approach, some prefer a softer approach. Some want bare bones; some prefer more extensive comment. It’s important that you understand one another’s needs.